Here's a Christmas card good enough to eat! 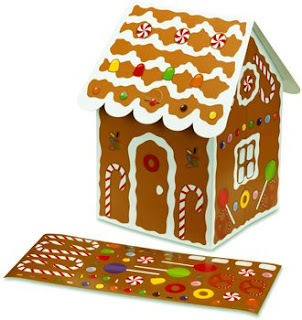 This pop-up gingerbread house from the Museum of Modern Art in New York City stands alone in the coolest card sweepstakes. Kiss goodbye to cookie cutter Christmas card images for good! Each card comes as a blank gingerbread slate -- just use the candy themed stickers enclosed in the box to create unique cards for each recipient. When all your creative juices have been spent, just flatten the house and it's ready for the post.